Our doula (Brianna, she’s awesome) was understandably hesitant to rush over because apparently first-time-moms frequently think it’s labor when it’s not, or they overestimate how far along things are. Matt gave her a play-by-play while poking an app that timed my contractions and she decided to come check me out. When Brianna arrived, I was dragging my giant belly out of the bathtub and I contracted again. While slippery wet, front-heavy and precariously balanced, I tried to reach for the phone so I could activate the app. On the drive to the hospital I remember very politely asking Matt if I could have both the air conditioner on AND the car windows down. We drove through downtown Orlando, pedestrians snapping their heads up in alarm at my screams whenever a contraction would seize. We parked in a parking garage. Matt ran into the hospital and grabbed a wheelchair and sprint-rolled it toward me, so the important takeaway is that if you are fast enough, you can steal a wheelchair from the hospital at any time. I then refused to sit in said wheelchair because when I contracted, all I wanted to do was stand and bend over. A tall young man spotted us and must have sensed the urgency without fully grasping the situation, because he asked if we needed directions and Matt said, “No thanks, we’ve got it,” and then when I stopped to contract again, clutching the wheelchair, the man looked at me, confused. “I’m having a baby,” I informed him, through clenched teeth. He executed a perfect double-take and exclaimed, “FOR REAL? !” with such genuine shock that Matt and I still laugh whenever we remember. This is where things get fizzy at the edges, but here are the tidbits I remember. I was hoping to move through labor with minimal intervention, but was in so much pain I agreed to a little something to take the edge off. Our friends Steph and James were our waiting room buddies, there for support and they kindly relayed messaged to family far away whenever Matt was able to slip out and give updates. After that first dose, Steph came in, and we were pleasantly chatting when I felt my water break. Unsure what that meant, she ducked out. 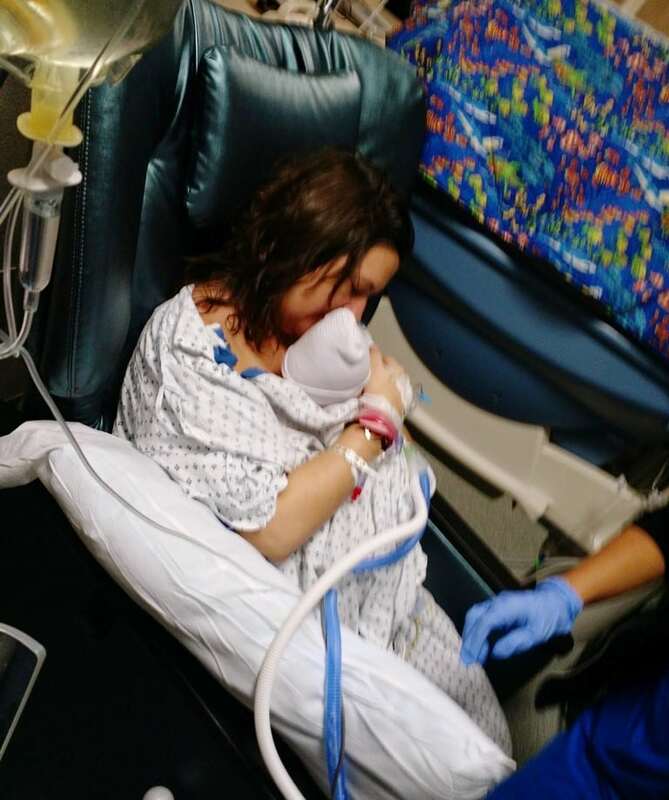 What it meant was the next rounds of contractions were tooth-rattling, pelvis-crushing nightmares, even more painful than the first ones, despite the drugs. I think that’s when I bit Matt. So it was decided I’d have an epidural. You know how it’s vitally important to be motionless as a needle is inserted into your spine? I scared the hell out of both Matt and the anesthesiologist when I suddenly leapt off of the bed not once but twice, as a contraction hit. Somehow, though, they made it happen. But it slowed down. I labored and dozed all night, requesting more epidural juice as needed. Around 6:30 a.m., my dose didn’t touch the pain. I asked what was happening and was told that just happens sometimes – the baby is far along enough the epidural can’t really help anymore. I decided it wasn’t going to get any less painful, and I might as well start pushing. Got the all clear. On average, for first time moms, labor lasts anywhere from four to eighteen hours. At that point, I’d been laboring for about 14 hours, so pretty normal. Actively pushing, however, is another story. (Before I actually had a baby, I had no idea these were two separate things. Just in case you don’t, either, active pushing is the stuff you see on TV – the screaming, feet-holding, sweaty, exhausting, “You can do it, just a little more!” part that actually gets the baby out.) Most first time moms actively push for 1-2 hours. I did it for nearly four hours. About halfway through, I contracted an infection, and so did Dexter. My fever spiked and I started to get a little delirious. I remember Matt’s face, cutting through the fog, stroking my hair and telling me he knows I feel sick and awful but I can get through this. Oh, and remember those friends and family who had been standing by, receiving updates? Because Matt was coaching for four hours straight, the information stopped, and we didn’t learn until later that we scared the daylights out of everyone, because they were certain that no news meant something had gone terribly wrong. The team coached me to push, to the degree that they told me not to scrunch up my face, because even that energy needed to be channeled to the baby. I pushed so hard that after Dexter’s birth, when I looked in the mirror, I had burst all of the blood vessels around my eyes. They tried the vacuum. Three times, as is hospital policy. The third time, the doctor pulled so hard he stumbled and nearly fell over. I was beyond spent, and I know there was talk of c-section. I wanted to give it one more round, and promised I could do it. Our doctor informed us that by now, Dexter was considered “stunned,” from the trauma of his birth. This meant a team of people were headed in, and he’d be taken immediately to the NICU. Somehow, finally, we got him out. A bloody, slippery wriggle of a baby, our baby, on my stomach for three seconds before they moved him to the heat lamp table a few feet away. Begging Matt to be near Dexter and talk to him and let him know his parents are here and how much we love him, because I was trapped on the bed, my work not quite done. And then everyone was gone. Just me and a doctor, doing some repairs, while I grew increasingly angry that after all that, things were still happening to me and they were things that hurt. Then me and Brianna and a nurse, checking my vitals and giving me more drugs. I felt my fever subside as if it had been pulled by the moon at low tide. Yes, she told me. It was. Dexter’s birthday was a long, hormonal day I barely remember. Crying on the phone to family members, telling them I was okay but Dex was in the NICU and it had been hours and I still hadn’t seen him or held him. Looking at photos Matt took, of our tiny baby hooked up to wires, a breathing tube taped to his cheek, an IV needle piercing the back of his perfect little hand. We had matching bruises there for days. A visit from a lactation consultant, where she taught me to use the breast pump until I was cleared to try to nurse. Partway through, I realized I was too foggy from drugs to absorb the lesson and I whispered to Matt, “I hope you are paying attention because I am too high to understand this right now,” and he said, “I am,” and that is the story of how my husband eventually taught me how to pump breastmilk. Finally, nearly dinnertime, I was told I could see my baby. 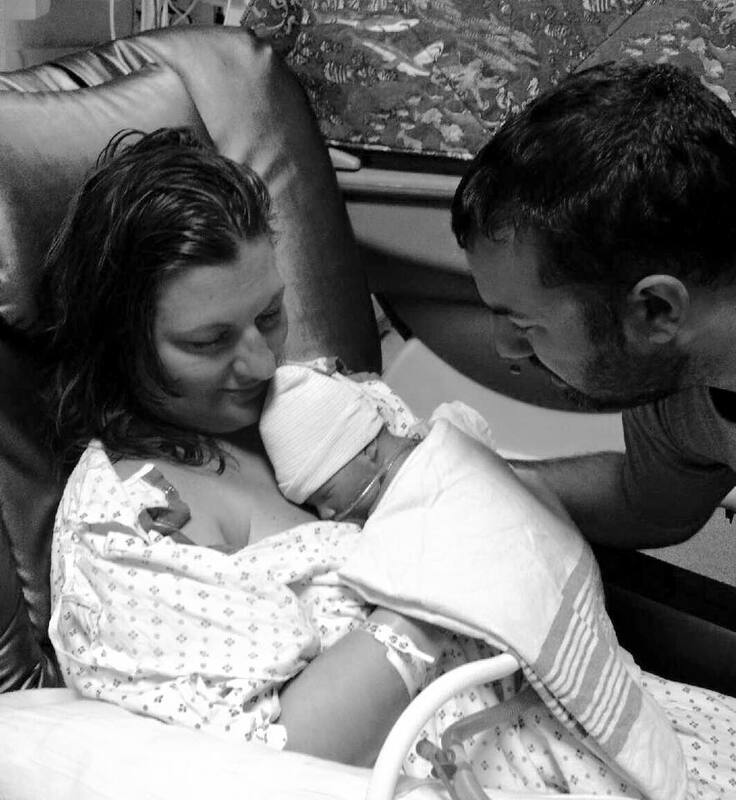 Matt wheeled me to the NICU and the nurse lifted him out of the plastic box where he lay and put his warm, kidney bean red body onto my chest, where he curled into me like he’d been waiting for that moment as much as I had. I took a deep breath, a single inhalation to try to pull a little bit of my baby back into my body, for one last time. “Oh, there you are.” Positively brilliant.